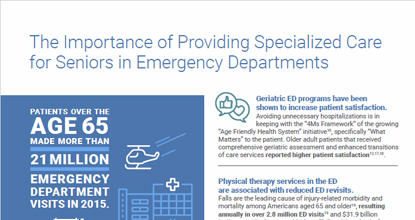 Geriatric ED programs have been shown to increase patient satisfaction. Avoiding unnecessary hospitalizations is in keeping with the “4Ms Framework” of the growing “Age Friendly Health System” initiative16, specifically “What Matters” to the patient. Older adult patients that received comprehensive geriatric assessment and enhanced transitions of care services reported higher patient satisfaction. To download this resource please fill the form below to access the fact sheet.